Novaris SL Test Plug provides access to field and equipment terminals plus earth via mini banana sockets mounted in the top face of the test plug and provides a convenient way to connect to these lines for testing. 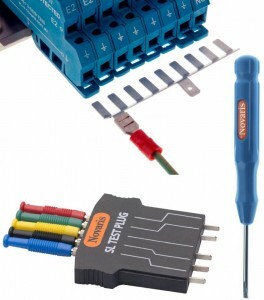 The Novaris SL Earth Comb provides a convenient means of connecting the common points of SL series surge protectors. The earth comb contains nine contacts, allowing banks of 8 SL protectors to be commoned together with one overlapping contact. The earth comb can be cut to provide a lesser number of points. The earth comb contains two 6.3mm spade terminals. The Novaris Screwdriver is sized to conveniently screw and unscrew the terminals.